One of my goals this year has been to read more Christian biographies, especially those of believers who have suffered persecution for their faith and have stood firm under trials. I’ve shared before my personal connection to persecution, as well as the fears and nightmares that haunted me for years, and how my study of Colossians freed me to rest in Jesus’ finished work, trusting in His power to save, sanctify, and secure me in Him. He is enough. But practically, I believe we’re called to prepare today for any persecution we may face in the future, not out of fear but out of faith. Truly, there are SO MANY great women and men who have gone before us, and they’re a source of great encouragement when we take the time to read their stories and be inspired by their God, who is the same yesterday, today, and forever (Heb 13:8). So without further ado, here the are! If you’re just getting started, pick this book first because 1) It’s short, 2) It’s life-changing. 3) It’s written by the founder of Voice of the Martrys. 4) It’s about a Jewish Romanian Lutheran pastor living in communist Romania. Okay, that last reason is superficial. But seriously, any time I’m asked to recommend Christian biographies, this is one of my first picks, because Richard and his wife Sabrina’s story has stuck with me and millions of other readers as well. You’ll not only get a glimpse at what it’s like to be imprisoned and tortured for Christ, but also how it’s the grace of Christ that sustains believers in persecution, not our own power or discipline. Equal parts convicting and inspirational. This is the kind of book that messes with you in the best possible way. Quite simply, Muller’s autobiography will challenge you to consider what it really means to live by faith and believe that God answers prayer. The stories he tells are almost unbelievable, if we didn’t have the Bible to affirm that we serve a God who indeed, does provide, does answer prayer, and does delight in giving good gifts to His children. I first read this book in college and I keep coming back to it when my prayer life becomes lackluster. Definitely worth reading. Does God really hear and care about the prayers of a little girl in communist Romania? The answer is a resounding “yes!”, as illustrated by this moving memoir. God Knows My Size isn’t just an account og a woman surrendering her life to Jesus and experiencing cruel persecution at the hand of Romanian communist leaders, but an honest account of how Silvia grew to trust God with the unknowns that came with obeying God more than men. But though this book contains heavy parts, you’ll be delighted by the humor and lightheartedness that permeates the narrative, true to Silvia’s own personality. I had the privilege of knowing Silvia personally, and though she’s gone to be with Jesus a few years ago, her radiant smile and abundant joy remain a source of inspiration to me even today. I can’t wait to hang out with her for all of eternity, worshiping Jesus together, and I’m pretty sure this book will make you feel the same way. Another Christian classic, The Hiding Place reveals the transformation of a young protagonist from fear-riddled to faith-filled. Corrie and her family face the most unspeakable atrocities as they risk their lives to hide Jews during World War II and later in Hitler’s labor camps; but rather than become embittered by the crimes she witnesses and those committed against her, Corrie grew to be filled with love for her enemies, demonstrating that there’s no pit that God’s love isn’t deeper still. If you’re not sure which book to start with on this list, let me recommend picking this up first. You’ll be inspired to discover that God doesn’t choose the most qualified or heroic to be His instruments… He uses the weak to showcase His own strength and power, and He can use you too. 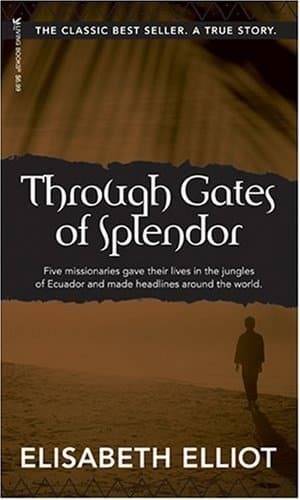 While not technically a Christian biography, this book is a compilation of stories of many Christian men and women who have suffered persecution, poverty, and prison for Christ. Originally written in 1570, this book has inspired many, including myself, by the cloud of witnesses who have gone before us. The current edition is updated with stories from the past centuries, spanning the lives of believers from A.D. 37 to 1997. A Christian classic you’ll want to keep on your shelf to come back to for a reality check when traffic, toddlers, coworkers, and everything else seems unbearable. Truly, Jesus is worth it all, and so much more. In contrast with Foxe’s Book of Martyrs, which can read a little dry at times, Michelle does a beautiful job weaving together the stories of these heroic women, and pulling you into their narrative. These are the real-life superheroes I want my girls to grow up with and look up to, because they point us to our Real Hero. Okay, so this last one is kind of a cheat, since it’s a series of biographies instead of a single book. But really, I couldn’t help myself. There are so many inspiring stories that I couldn’t limit my list to just 10. This series comes highly recommended by homeschooling moms I know, and provides a gateway into the world of Christian biographies for children as young as 7-8. I look forward to reading this series with my own kids as they get older. I haven’t read these books myself, so I can’t recommend them personally, but I recently asked my Facebook friends what some of their top favorite Christian biographies were. I then went through their faves and picked a few that I’m adding to my own “to be read” list (in bold below). Which Christian biography will you pick up next?